My cousin Becky and her dog. The ability to nap is clearly in our DNA. I have a friend who insists that she can’t nap. No matter how hard she tries, she says she just can’t relax enough to curl up on the couch, close her eyes and catch a few minutes of shut eye during the day. I think there’s something seriously wrong with her. I love taking a nap but I’ve always felt like a lazy slug for lying around in the middle of the afternoon while the rest of the world is slaving away. 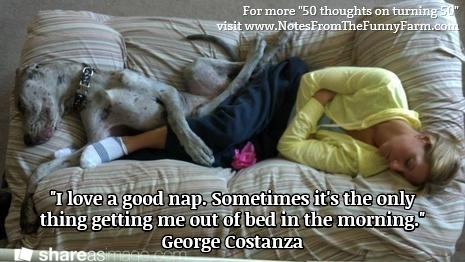 Then a few years ago, my doctor told me that it’s good to take a nap during the day. Not a big, deep sleep. Just a short, 15 or 20 minute snooze to clear away the cobwebs and recharge your batteries. As someone who loves taking a nap as much as I like drinking tea, you can be sure I’ve followed her advice as often as I can. In fact, I’m off to take a nap right now. Today’s lesson? Napping like a dog is a lot better for your life than working like one.